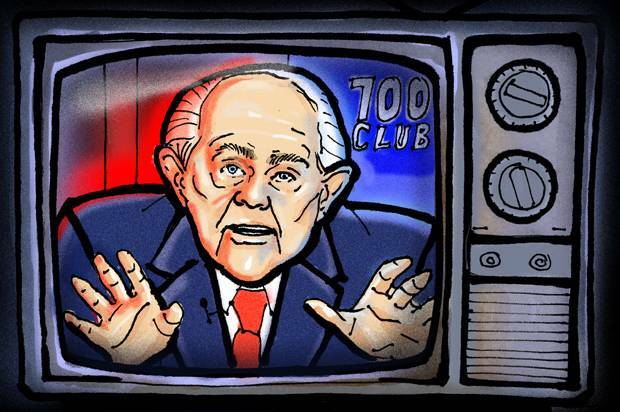 Before there was Fox News, there was “The 700 Club.” The thousands or perhaps millions of Christians influenced by “The 700 Club” over the last four decades are good people. Their intentions are noble. They mostly wish that others would find the peace and contentment they’ve discovered for themselves. Along the way, however, the essential gospel call about feeding sheep and lambs has been overshadowed by a perceived need to not just challenge the evolution of our culture but also directly participate in what they view as its restoration. Certain Christian leaders whose motives—while presented as above reproach—have fed them Biblical mandates that seem to justify this participation. However, a deeper examination reveals that the gospel being most preached today is a form of self-centeredness: the gospel of self. I know this, because I helped teach it while serving as Pat Robertson’s producer and executive producer during a most critical point in the TV program’s development, the 1980s, when Pat himself decided that God had called him to run for president and that he would win. The story of how this happened is my story, and the gospel of self is the dark side of that chronicle. History will record that “The 700 Club” was the taproot of that which moved the Republican Party to the right and provided the political support today for a man like Donald Trump. A 2015 Harvard report concluded that right-wing media was driving the GOP, not Republican leadership, but this assumes that in order for people to behave as cultural radicals, they must be manipulated into doing so. This is a misleading interpretation of human nature and the power of personal faith. It would be absurd to suggest that the many elements of right-wing media didn’t play a role in this, but those who challenge this right turn by the GOP need to look far beyond the institutional power of media to influence. Conservative talk radio, Fox News, offline publications, and the hundreds of online observer websites would simply not exist without an audience driven by a faith-mandated conscience and thusly predisposed to their messages. We knew this at CBN in the early 1980s, and as long as we could present current events in what we called “a Biblical perspective,” people would take an interest. This form of Christianity blends so well with the Republican Party because both are formed around a circle with self at the center. This was the overarching albeit unwritten strategy of Pat Robertson, although there were many in key positions at CBN who either weren’t aware of this or simply refused to see it. To me, it was pretty obvious and was later proven in a memorable private discussion I had with Pat about fundraising. That was Pat in 1981. So the vision was set and the only missing element was money. After all, CBN was a ministry. It paid no taxes as a media company, and the tax exemption was worth far more than any for-profit business model, especially in 1981. Pat Robertson was a brilliant marketer, however, and despite his professed faith in God to take care of providing resources, very little at CBN was left to chance, and that applied especially to fund-raising. Only a small part of marketing is creative or innovative; most of the blue-collar efforts involved processes and were extremely scientific. We knew, for example, what percentage of 700 Club members—at fifteen dollars a month – would covert to 1000 Club members—at eighty-three dollars a month—and we knew, on average, how long that conversion would take. We had the same data in terms of converting 1000 Club members to 2500 Club members, and turning those members into Founders Club members. Based on past growth, this allowed us to extrapolate a budget projection, and that’s what we used to make our plans. But behind it all was the mind of a fund-raising genius, a man who understood human nature like few others, and mostly a man who was unafraid to exploit that understanding in a justified means to what he felt was a righteous end. I learned how to raise money directly from Pat Robertson, and his methodology might surprise the faithful, for it is built on self-centeredness. And if the core of its ability to raise money is built on selfishness, then it must follow that the CBN message itself must do likewise. This is the secret truth behind what we intended to present as a movement of God’s spirit on the earth. We don’t necessarily have to present everything as a crisis, but it’s impossible to make a change when everybody feels good about existing circumstances. That’s the mistake Reagan has made. He got re-elected but now faces difficulty in implementing change, since he sold the country on the fact that everything is hunky-dory. We need to tie the spiritual with the natural (meaning current events). He told the people what to do in light of the current events. We need to do the same thing, because if you can do that, you really have something that’s worth something. I’m fulfilling the great commission, spreading the gospel to the world. I’ll get blessed if I do. I’m helping others who are poorer than me. It’s like a finely tuned orchestra. You don’t play all bass and you don’t play all treble. Together, they make a wonderful sound. People also like to be part of a winner. Nobody likes to lose. Challenges are important, because people are goal-oriented and respond to peer pressure. Bargains are important, like building a $13 million building for $100. There is also a thing of the old folks wanting to help the young, sort of to perpetuate society somehow. What Pat Robertson taught me that day was that success in Christian television ministry began with tweaking the self-centered core of human nature. Notice that he painted a picture of expanding circles, each moving away from the recognition of self at the center. Helping the poor is at the bottom of the list, almost as though that particular motivation is separate from the rest, and this was played out in our use of Operation Blessing to hit a particular kind of Christian giver. The rest, however, formed the core of our ministry and our fundraising. Armed with this kind of direction, it was easy to craft not only fund-raising but also everything else associated with The 700 Club television program. Taking over the country for God wasn’t so much positioned as a duty; it was more like “you need to do this for yourself and your family.” It’s a subtle difference in the marketing practice of positioning, but it’s a much more powerful motivator. This is core Pat Robertson, and nothing he did, said, or accomplished makes sense without this layer of understanding included in the final analysis. There was nothing sinister about it to us; it was a sincere and genuine desire to change the world for good, although its ultimate fruit has been chaotic, divisive, and dangerous. We felt the hand of God guided us, and I write that in all sincerity. We looked at progressive culture and saw only evil. We felt animosity against Christianity and the church. We were mocked and ridiculed in the media, especially that which was coming from Hollywood. We felt that God was giving things over to us to make things right. What we didn’t see was the trap of our motives being driven by self. After all, does God really need us to fix things that we viewed as wrong? Even Pat’s acclaimed manual for living, The Secret Kingdom, is a diagram for using the Bible to justify a lifestyle that is built around self, self-gain, and self-betterment based on the above expanding circle. It’s a self-help book disguised as theology. Every “law” proclaimed is designed to help individual people, families, and communities get ahead in the realm of human competition. You can make yourself healthier, wealthier, safer, happier, and more dominant in the culture simply by living within these “laws of the Kingdom.” It’s a beautiful companion to the teaching I was given about fundraising and further evidence that we were really teaching a very insidious form of selfishness, the gospel of self. * I am making this material available in accordance with Title 17 U.S.C. Section 107: This article is distributed without profit to those who have expressed a prior interest in receiving the included information for research and educational purposes. I first got into journalism because I thought I could make a difference. Spencer the Garbagehead had dropped some very powerful Owsley Purple, an hour or so ago. It didn't matter exactly when. He was at one with the All. His gaily painted Herse was just chugging onto the Golden Gate Bridge. All was red and gold, flashing, flashing. All the people in the shiny fruits and vegetables chugging next to him... they were God. He heard a siren. A cop car pulled him over. "Just haw fast you think you were going? ", the cop asked Spencer. Spencer, peaking and flashing, attempted to gather his wits. He'd better play it on the conservative side. He couldn't have been going that fast. "You were going four miles an hour," said the cop. "Get out of the car!" 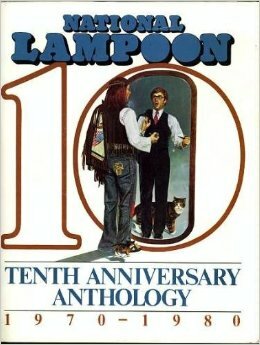 I saw the above gif the other day, and it fit perfectly with the above text I ran into 35 years ago. I'm just glad that I held onto the book this long.